Very windy, but we decided to sail again. Just two boats ventured out. Alan T/James P H were unstoppable. Anton H/Joy W enjoyed the high winds and were pleased to get around the course without a swim! That concludes Series B. No discards were applied. Very windy, but we decided to sail. Racing today was very tight with three boats within a minute of each other. Big gusts causing all boats to loose sail sometimes in a hurry. Also the new cabin arrived!! Its great, pictured here on the day it arrived. 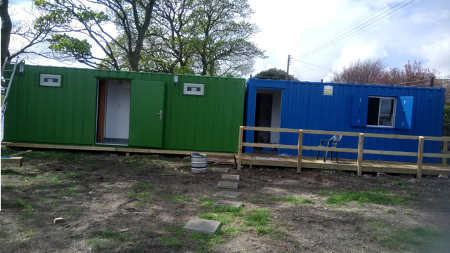 It has Male and Female changing rooms with showers. A kitchen also arrived which will in due course be fitted to the first cabin. construction is underway to make a decking feature. A steady breeze F2/3. Sailing from the Perch to Fahan, Conniborrow and back to a Mark near the Perch X2. High water was at the start of the start of the race. James P H and Alan T sailing very well with Bill J and Joe McC giving them a good chase. Did not see this mid week race, the first such of the season. Racing for the first two Wednesdays has just one race per night. Once the nights get longer we expand to two races per night. Although I wasn’t racing I did note it was pretty windy, in fact it looked ideal. Races 11+12 racing in Culmore bay on a fluky day with two 180 degree wind shifts. Beat up to Harts, get becalmed and then beat back to the power station in R1. In race two a reaching start and run up to Harts then a gust and run back to the power station. Todays racing also concludes SERIES A. Two discard races have been allowed (marked d). Races 9+10 A bright windy day – perfect for sailing. A request from the Harbour Master was received not to sail until a large boat passed into the port. The OD observed this request and racing was duly delayed by about 30 minutes. Racing from the start line between flags and Leonard’s mark. Up to the Power station, run to Faughan, reach to Conniburrow beat back to the power station. Windy and gusty with an exciting reach from Faughan to Conniburrow. Bill J and Joe McC took the lead in race one but Ken and Davy passed them on the reach – which was too tight for a spinnaker. Anton H took the Jibe mark too close and hit the mark with the main sheet and had to do a 360. In race 2 Anton H, racing in the club laser was buzzing the stern on Bill J and Joe McC on the reach. Bill and Joe pulled away again on the beat but Anton H took second on LFYC handicap. 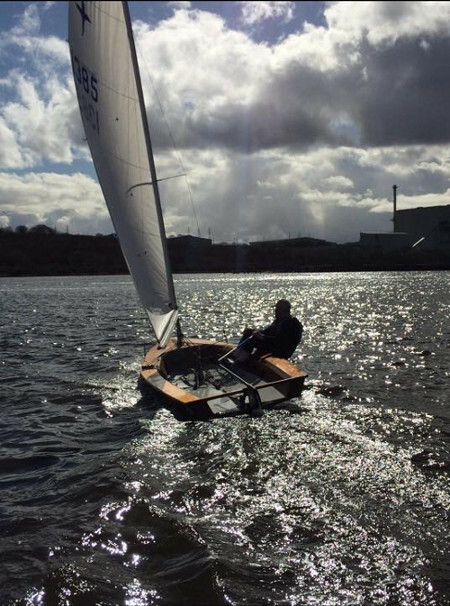 Kevin T got blown over on the beat but managed a a dry capsize – nice trick and recovered without much loss. Races 7+8 A bright breezy day blowing Easterly F5 and gusty. A big wind shadow behind the power station causing all sorts of swirling conditions. Racing from the Perch to a mark by the old docks, reach down to Fahan then tight reach (no spinnaker) to Conniborrow. It was touch and go decision to fly the spinnaker at all. Great racing very tight between Anton H and Owen McC and Ken and Peter L in both races. Great to see George G out in his Solo. NB: Back by popular demand: Two discard races will be allowed in the final result calculation. Races 5+6 I didn’t see this race myself but note long race times in race 1 (winners at 78.50) and short race times in race 2 (winners at 28.01). I suspect light winds and a shorter race course set for race 2. Great to see George G on the score sheet. James H and Alan T sailing very well with two wins and moving up the series table. Racing at low tide from the perch to Faughan, tight reach over to a mark near Conniborrow back up to a mark near the Perch X2. Light winds N F2/3. Bright but a bit cold. Running aground was a high risk. Very strong flood tide in the second race. Making the correct navigation decisions was at a premium. Ken and Davy L were on top form making it all look too easy. Great to see Joy W out in the club Laser. Note: The results above reflect the LFYC handicap. Total number of participants in the race +2pts for a DNS. Total number of participants +1pt for a DNF. No discards will be applied. The first race of the season. Good luck to James P H who launched his new GP14 today. Great to be back sailing after a long summer and a beautiful day to start the season. Sunshine and a good breeze (F3-4). Sailing in Culmore Bay. Starting at the slipway, up to Harts, run down to Gilmores, reach over to the Power station through the line X 2 for the first race, X3 for the second. Good racing, lots of place changes. Great to see James H Snr out on the Phantom. Races start on time: The time of the race start indicated is the time of the five minute gun. It is up to sailors and crew to be on the water and in the proximity of start line. The OD (depends who it is, take your chances) will (probably) not wait! The last sail of the year – and it felt like it. Windy, rainy, cold. Nonetheless two lasers went out. A few dodgy Jibes today over near the jetty – made more difficult because the wind near there is affected by the power station. After the sailing we adjourned to the hut and had Christmas Pudding. Many thanks to Liam and Ken and Pete for rescue and officer duties. As we were packing up work was in full flow laying the timber founds for the new changing room. It will be a great bonus next year – see you then. Three short races, first race two laps, second and third one lap each. Wind picked up for last race leading to very fast times. Anton H and Joy W showing a bit of nice style with quick spinaker raising and lowering. Racing in Culmore Bay, James McL going very well in the Laser. Shifty conditions ranging from F1 to F5. Cold but bright and sunny. Race No 4 was two laps, Race No 5 was one lap. To keep people warm instead of the usual five we adopted a two minute gun for the frostbite series. Two mins, one min, Go. After the racing we headed to the hut for coffee. The sailing on this year’s Hot Toddy was blown out. A freezing gale was blowing. But on the upside we still had the whiskey! So we did the only thing we could and sat in the new hut and drank merrily. This year’s Hot Toddy was partaken in the new hut, which has a good roof, a window, a door and heater. It also has a plug for the kettle and a table and seats. A great improvement over the usual location in the castle – nice as the castle is. Many thanks to George D who once again provided the hospitality. Blowing a gale!! It was doubtful if we would get out. Eventually three Lasers set out. The course was in Culmore Bay. Congratulations to Kevin T, nice sailing. This race was started from the water using a whistle. The times were accurately recorded using a swiss watch. The handicap was calculated using a deep learning neural network running an advanced algorithm developed by NASA. The results you see above are the considered working of the processes mentioned. Ciaran and Eva M steadily moving up the ranks. Well done to them! Kevin T going well in his Laser. Great to see Paul J out in a dinghy. He still can do it, I think he surprised himself! You are currently browsing the archives for the Race results category.